Here's my final page on backpacks and satchels. After all I've already bought mine so interest has waned. 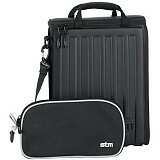 This one is by STM and called the STM Small Armor. STM is an Australian Company so world wide it should be reasonably unique to own. It's for 13 Inch notebooks and laptops. Measures 32.5 x 23.5 x 4cm / 12.8 x 9.3 x 1.6 inches. 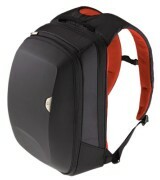 Constructed of outside with EVA plastic and very padded interior. Nice looking bag and definitely well built. The only issue I have with this one is that it comes with an external carry bag for the power adapters and mice. That said if you had a smaller computer - say the latest small notebooks everything should fit in the main case! It is only a shoulder bag style nonetheless great bag! Even Apple stores stock them. The next model I found was from the well known maker of mice and keyboards - Logitech. It's called the Kinetik backpack. If you think its very similar to the AXIO FUSE you're right. 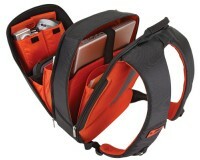 It's essentially the same bag but customised for Logitech. I think the shape of the Logitech is a tad odd and looks physically bigger. So the only reason I'd chose this over the AXIO is price. Indeed the Logitech is cheaper. The Kinetik also comes in a briefcase form. However I don't know who the actual maker is but it is branded Logitech. Looks good but I think there are other 'soft' versions that would probably just as good. Consider the price before deciding.